I knew I was back in the high country when I realized the trailhead to rejoin the PCT was located at 10,000 feet elevation. From there I hiked 2.5 miles and climbed an additional 1000 feet before I rejoined the PCT. Since I hadn’t hiked in a few days this initial reentry to the trail was a bit of a challenge. After that the PCT more or less leveled out at 11,000 feet. The good news was that I didn’t see any snow other than small patches on the distant peaks. What I did see was a beautiful expanse of mountains that make up the Sierra range. Later I discovered that my first impression about the absence of snow was wrong. There still was a fair amount on the passes I would have to cross on my way north. That first day back on the trail I hiked about 18 miles, which was pretty good since I started late that morning. 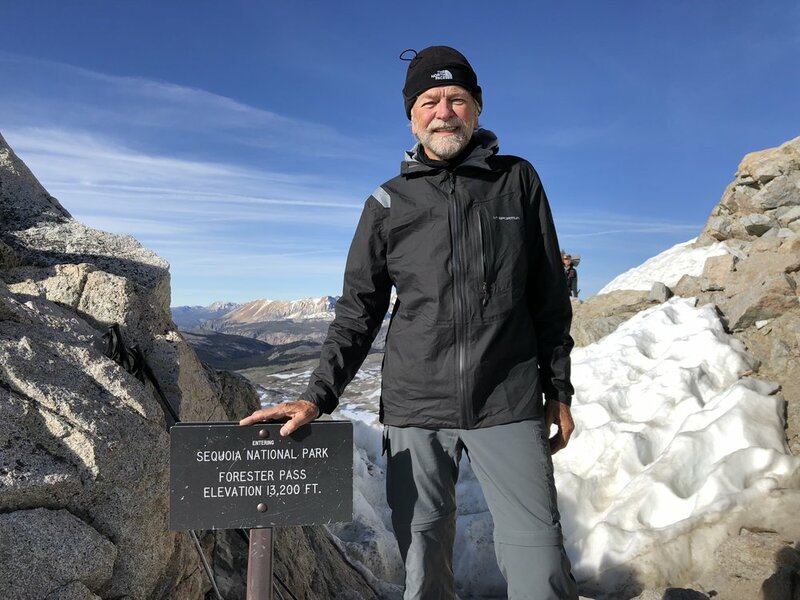 The next day I intentionally cut short so that I could get up early the following day for the hike over Forester Pass (13,200 feet high). I wanted to get to the pass early while the snow was crusty and the ice was still frozen solid. With my micro spikes the risk of slipping would be minimal. My plan allowed me to easily get over Forester in less time than expected. So I pushed on and made it over a second pass, Glen Pass, later that afternoon. Conditions there were not as good as they were on Forester, but there also wasn’t as much snow to contend with. Doing two big passes in one day built my confidence, so the following afternoon I decided to hike over Pinchot Pass knowing the snow would be soft. Conditions on Pinchot were far more difficult than I anticipated. Snow obscured the trail, which meant I was off trail and post holing in soft snow most of the way. “Post holing” means you sink up to your knees in snow with every step. If the snow is frozen, like it was on Forester, it would typically hold so I could walk on the surface. Needless to say, the hike over Pinchot was tough and took a long time to traverse. The other pass that was also difficult was Muir Pass, named after naturalist John Muir. There were several miles of deep snow on both sides of the pass. I learned my lesson on Pinchot and got as early a start as I could. Doing so I was able hike up to the pass without too much difficulty, but going down the other side became more and more problematic as it got warmer and the snow melted and got softer. After a couple grueling hours post holing I was out of the snow and back on terra firma once again. So far, this probably sounds like I was having a miserable time. Quite the contrary. The views and scenery were truly spectacular and more than made up for the difficult conditions. Everywhere I looked there were magnificent sights. I included a few pictures to give you an idea of what it was like. My pictures, however, don’t really do it justice. They don’t capture the cool wind on my face, the smells, the sounds, and the enormity of the place. Another thing that impressed me while hiking through the Sierras were the many rivers that crisscrossed the range. Most were running high due to the rapidly melting snow. I was forced to ford some rivers where there were no bridges over the rushing water. The most difficult ford for me was the Bear Creek crossing. I crossed it at 6:30AM when the water was just above my knees and running swiftly. As I crossed I couldn’t help but reflect on the two young women who drowned there last year when the water was much deeper and flowing even faster. 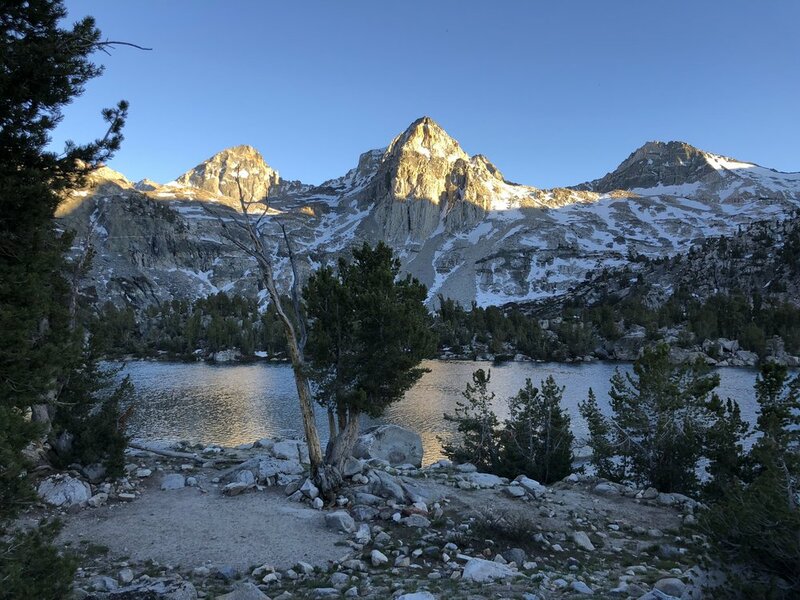 The Sierras also are blessed with hundreds of beautiful mountain lakes. Some were so stunning that their beauty stopped me dead in my tracks. 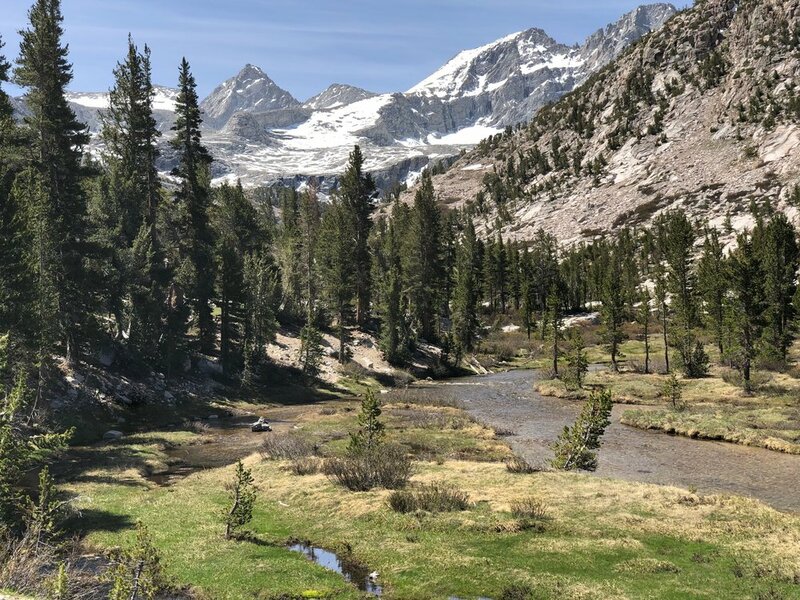 Tall mountains, high passes, snow, lakes, rushing rivers and expansive forests; the Sierras have it all. If you ever get the chance to hike in this area of Central California, take it. The Sierras are magnificent and there is nothing like them in the lower 48. After eight days of strenuous hiking, I made my way to Vermillion Valley Resort (VVR) to resupply and take a rest day. The term Resort is a euphemism for a very rustic place high in the mountains, but it was like heaven to me. Lots of good food, a warm shower, laundry facilities and a real mattress to sleep on were just what I needed to recover. Vermillion Valley Resort. The dog didn't think so. More high passes and another 70 miles, and I made my way to Yosemite National Park’s Tuolumne Meadows. There I camped in an area the park service set aside for backpackers that was near a small store where I resupplied for the next leg of my journey. Also ran into some familiar hikers I had met along the way. 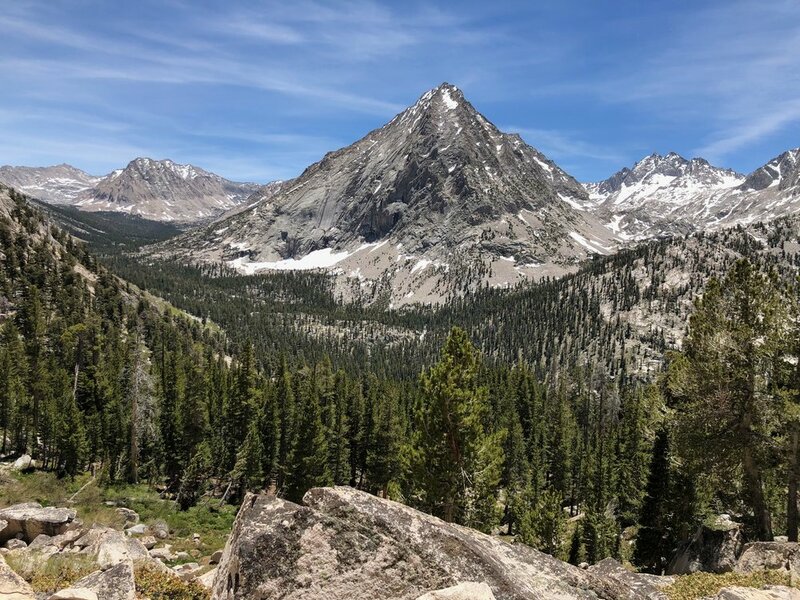 There were three young hikers I had met in Northern California, others I briefly hiked with in the Sierras, and still others I just met at Tuolumne. Doing something like the PCT you immediately develop a bond with everyone else on the trail, as you all share the same difficult but rewarding experiences. Friendships amongst “through hikers” are formed in an instant. 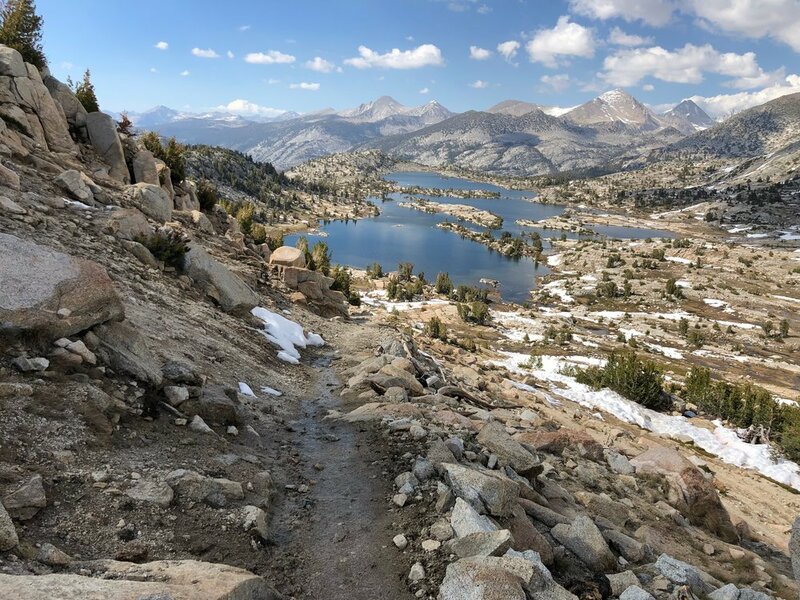 After Tuolumne I incorrectly assumed the trail would flatten out. I couldn’t have been more mistaken. The trail was just as difficult with as many ups and downs as before. That section of the trail also had a serious mosquito problem. I don’t recall a time in my life when I ever encountered as many mosquitoes hell bent on sucking every ounce of blood out of my body. Every inch of skin had to be covered else risk being bitten by hordes of the blood thirsty little devils. One day, while hiking this section the trail, I crossed a paved road near Ebbet Pass. To my surprise and immense joy, a trail angel had set up a hiker rest stop in the small parking area on the other side of the road. I learned that Chipmunk (his trail name) had been doing this for many years as a service to the hiker community. He fried up two eggs, smothered them with homemade chili and served it with bread and butter. I told Chipmunk that seeing him there at the pass was a miracle, a dream come true. After downing the meal he prepared, a banana and several glasses of cola, I said goodbye to Chipmunk and headed down the trail again. Just another example of the kindness and generosity of strangers. More stunning scenery awaited me on my way to Kennedy Meadows North, Echo Lake, and Donner Ski Resort. At each of these places I also made a point to stop in at the local cafes and eat as much food as I could stuff into my belly. Although I carry as much lots of food in my backpack, I need to augment my intake of calories at these stops. Otherwise, I would lose too much weight and not have enough energy to keep pushing down the trail. 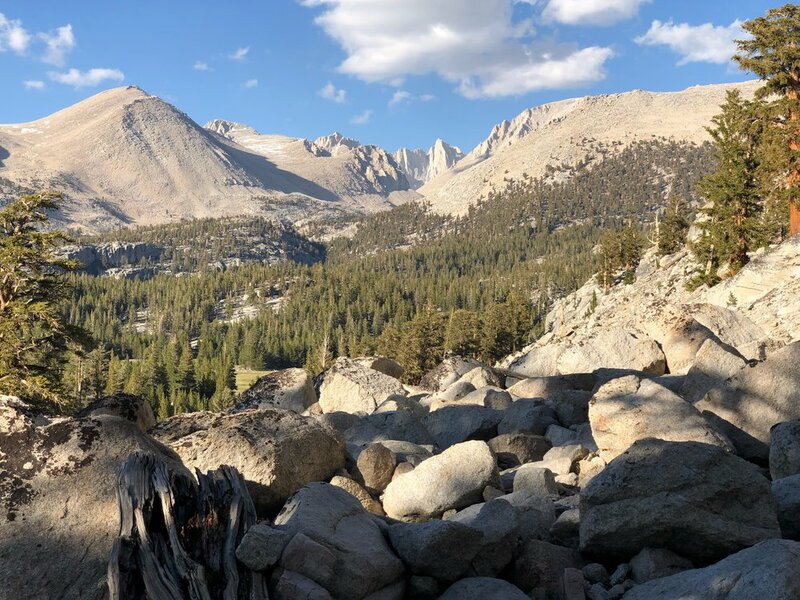 On July 2, l made it to Donner Pass and hitchhiked a few miles east on Interstate 80 to Truckee, California where Alena picked me up and transported me to the starting point of the next leg of my journey north to Canada. As of July 2, I had completed a total of 1,463 miles, and I am still not out of California.